At Wee Care, our first priority is the wellbeing of your child. While we have a team of committed, capable physicians, nurses, and staff, there are times when the Emergency Room is best for your child. If your child has any of these symptoms, take them to the Emergency Room or call 911 immediately. Uncontrollable Bleeding: Severe or uncontrollable bleeding signals a medical emergency. Losing too much blood could put your child’s life in jeopardy. Apply pressure to the area immediately and call 911. Severe bone fractures: Severe bone fractures include any time a bone is visibly dislocated, bent, or the bone is visible under the skin or poking through the skin. Coughing or vomiting blood: Coughing up or vomiting blood could signal a bleed inside your child’s stomach, throat, or lungs. Vomited blood may appear brown and grainy, like coffee grounds. Severe burns: Skin that looks charred, darkened, or white and leathery indicates at least a 3rd-degree burn, and can indicate damage to the deeper tissues of the body. Even though severe burns can feel numb, they require immediate emergency care. Burns should also be treated as serious if they are less severe but cover a large area. Severe Seizures:Symptoms of a seizure include shaking and loss of bodily control. Seizures can be caused by head injury or an underlying, undiagnosed medical condition. Severe abdominal pain: Severe abdominal pain can stem from a great number of problems which are not distinguishable without a medical exam. Since some of those problems require urgent care, take your child to the emergency room for any unusual or severe pain. Remember that Emergency Care is appropriate for any situation where your child’s life could be at risk. Do not hesitate or delay treatment if you suspect that this is the case for your child. Emergency facilities have the equipment, manpower, and surgical access to handle life-threatening injuries in the safest way possible. If you suspect that your child has ingested anything that could be harmful, such as household chemicals or medications, immediately contact poison control. Poison Control is available 24/7, and they offer free, confidential medical advice. On the Poison Control website, you can also find information about preventing poisonings in the home and learn more about poison alerts. Wee Care is happy to offer urgent care services for injuries or illnesses that aren’t immediately life-threatening. We have same day appointments and a limited number of walk-in appointments available—so you won’t have to wait long to get your child the treatment they require. If you aren’t sure whether or not your child should be seen at urgent care, contact our office. You can call and talk to a nurse 24 hours a day, 7 days a week. Our nurses field thousands of calls a week, so they can tell you when to bring your child in and when at-home treatment might be best. Here are just a few of the conditions treated at Wee Care. 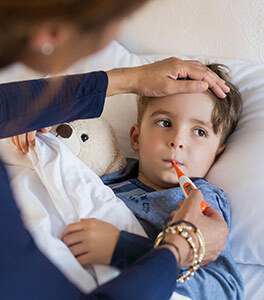 All common childhood illnesses including sore throat, cold symptoms, breathing difficulty, fever, rashes, ear aches, and vomiting. Constipation and digestive issues including food allergies. Skin disorders including rashes, eczema, and wart removal. Allergies* Note: Severe allergic reactions should be treated in the Emergency Room. Laceration repair: Our urgent care physicians can clean out wounds and offer stitches right here in our office. Bites and burns including insect stings and spider bites. Fractures, including casting. Our Layton location has X-Ray equipment on-site. Please note that walk-in appointments are offered on a first come, first served basis. If you need an appointment, it is best to call first so that we can give you a better idea of what kind of wait time to expect. At Wee Care, We Care. We understand how scary it can be when your child experiences a sudden illness or injury. For this reason, our team is trained to handle urgent care situations calmly and to do everything in our power to soothe and comfort your child. Our goal is to treat your child quickly and efficiently without making the experience intimidating for you or your child. To make emergency situations more manageable for kids, we will explain their symptoms in a way that your child will understand. We want all of our patients to know that they are in a respectful, caring environment where they will receive the best medical care possible. For information about common illnesses, medication dosage charts, and well check schedules, click here.